The Dead Sea is a very salty lake that is located between Israel and Jordan. At 420 meters (1,378 ft) below sea level, it is the lowest point on Earth that is dry land. It is also the second most saltiest body of water in the world. It is also the deepest salt lake on earth at 330 m (1,083 ft) deep. 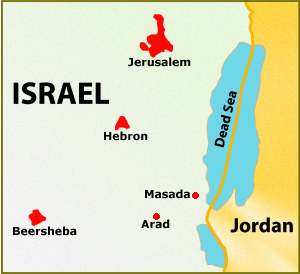 The Dead Sea is called “Yom Hamelach” in Hebrew. The Dead Sea’s climate offers year-round sunny skies and dry air. 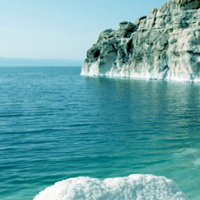 The northern part of the Dead Sea receives only 100 mm (4 in) of rain a year. The southern section just 50 mm (2 in). 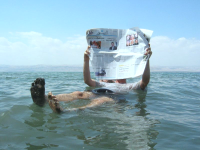 Because the Dead sea is so salty, you can actually float on the water. The Dead sea is home to many resorts and spas. 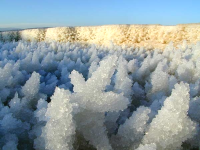 Many companies use the salt from the Dead Sea for bath salts. The entire southern end of the Dead Sea has big evaporation pans that is used to get the industrial chemicals potash, caustic soda, magnesium metal, and sodium chloride.